The mechanisms involved in repair of DNA double-strand breaks (DSBs) guard genome integrity in healthy cells but they can also protect cancer cells against the therapies that target their DNA. The long-term research goal of our group is exploring the cellular responses to DNA damage to develop and improve anticancer strategies relying on manipulation of DNA repair in normal and cancer cells. DSB repair and cancer. Many successful anticancer agents, including ionizing radiation and multiple chemotherapeutics, exert cytotoxic effects by inducing double-strand breaks (DSBs) in DNA of tumor cells. However, mammals evolved robust DSB repair (DSBR) mechanisms which reduce the efficacy of these agents. Therefore, inhibition of DSBR and exploitation of DSBR defects are among attractive anticancer strategies. These strategies hinge on deep understanding of DSBR mechanisms in cancer as well as in healthy cells, because optimal therapies should target the former and spare the latter. Problem. Most known DSBR proteins localize to DSB sites, where they establish complex structures, interacting with each other and with the adjacent chromatin. These dynamic processes, termed here ‘DSBR choreography’, can be visualized in live cells (Figure 2), providing crucial information about the underlying molecular mechanisms . Over the last decade, independent groups inspected individual DSBR proteins at damaged DNA or at neighboring chromatin. However, the vast majority of these studies focused on unrelated cancer cell lines and used diverse artefact-prone, clinically irrelevant methods of DSB induction. As a consequence, the available data are fragmented, incomplete and cannot be related to each other. Importantly – and perhaps surprisingly – basic parameters of DSBR (e.g. 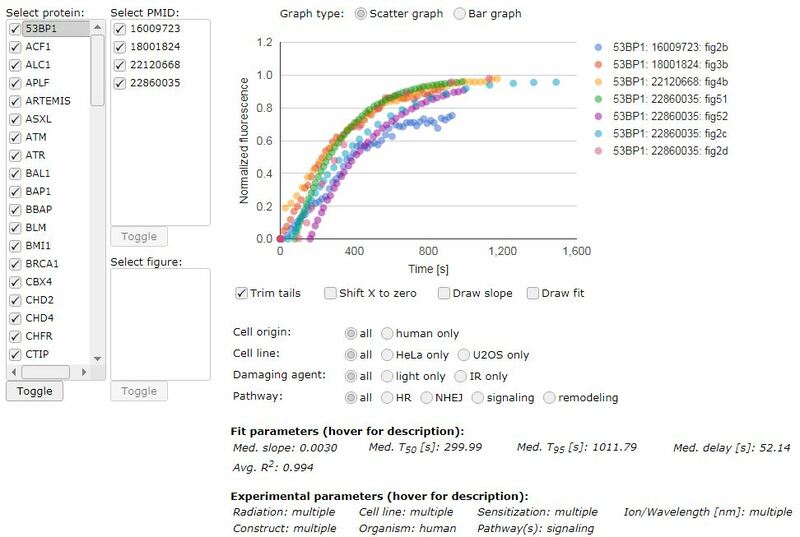 the temporal sequence of repair events, real-time interactions between individual DSBR proteins and spatial organization of repair activities in the context of chromatin) in normal human cells remain practically unexplored. Because of this profound deficit in our understanding of repair processes in normal cells, it is currently not possible to determine how they are altered by oncogenic transformation. Aim. We are investigating, for the first time, DSBR choreography in normal human cells, and how it changes in cancer cells. In particular, we focus on comparing: (I) the kinetics (mobility) of most known DSBR proteins in undamaged cell nuclei and at damaged DNA/chromatin; (II) the temporal sequence of accumulation of these proteins at well-characterized DNA lesions induced by clinically-relevant X-ray microirradiation; (III) super-resolution localization of proteins during DSBR (Figure 3); (IV) the interactions between individual proteins in irradiated living cells (DSBR interactome). These experiments will address multiple open questions and expose some properties of DSBR processes that are crucial for understanding cellular responses to DSB-inducing therapies. How do DSBR proteins interact with intact chromatin (which is essential for sensing DNA damage) and with structures they establish at DSB sites (which is important for repair)? What is the temporal sequence of repair events in live cells? How is the DSBR machinery organized at damaged DNA/chromatin and how does this organization change during repair? How do DSBR proteins interact with each other in the absence of DNA damage and at DSB sites, and how do these interactions change as repair unfolds? And most importantly, whether and how these aspects of DSBR change in transformed cells? Figure 1. Main research aims. Figure 2. Accumulation of various DSB-repair proteins at DNA damage after X-ray microirradiation. Cells expressing the indicated proteins fused to Clover were micro-irradiated in the areas indicated by the red circles and imaged for up to 60 min. Images show frames acquired at the indicated time-points. Figure 3. Super-resolution imaging of spatial organization of DSBR proteins in response to X-ray induced DNA damage. 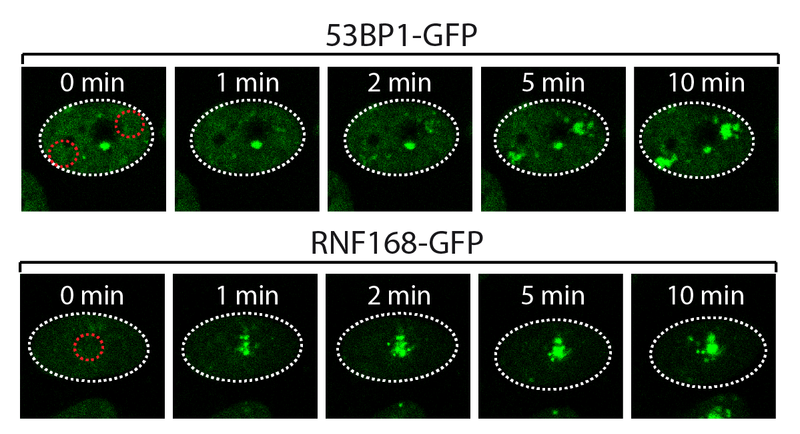 Wide-field (left panel) and super-resolution (right panels) imaging of DSB marker γH2AX (green) and RNF168, RPA1 and 53BP1 (purple). 2. 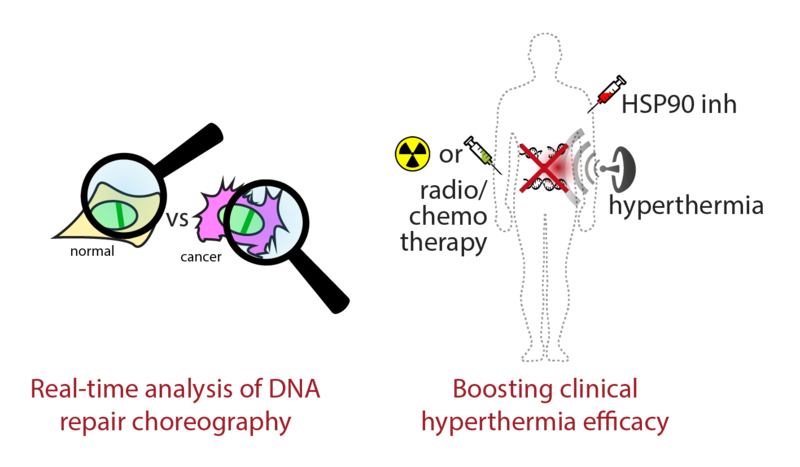 Improving hyperthermia-based clinical cancer treatments. Hyperthermia and cancer. Hyperthermia (HT) – temporary elevation of tumor temperature to 41-43 °C – alters many aspects of cellular metabolism, but its effects on DNA repair are of special interest in the context of cancer research and treatment. HT inhibits repair of DNA double-strand breaks (DSBs), making it a powerful radio- and chemosensitizer with proven clinical track record in combination therapy for various types of cancer, including breast, bladder, head, neck, melanoma, soft tissue sarcoma and cervix. Problem. The efficacy of HT treatments is negatively affected by a number of factors, such as insufficient thermal dose, temporary nature of HT effects (resulting in a short therapeutic window) and thermotolerance (induction of a temporary resistance to subsequent HT treatments). It is thus evident that outcomes of HT therapies would benefit from strategies to: (I) Increase HT efficacy at lower temperatures and shorter treatments; (II) extend the duration of the therapeutic window and (III) eliminate or reduce thermotolerance. Results. Recently, we found that a short incubation of cervix cancer cells in the presence of a HSP90 inhibitor ganetespib enhances the effects of concomitant HT treatment in vitro, nearly without affecting non-heated cells. 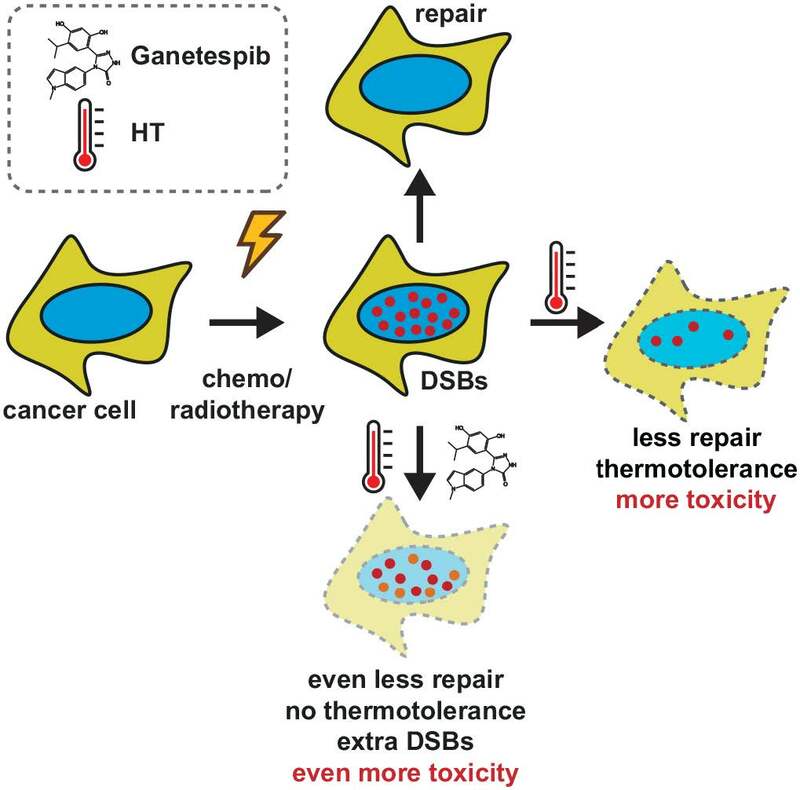 In particular, ganetespib (i) potentiated cytotoxic as well as radiosensitizing and chemosensitizing effects of HT; (ii) enhanced HT-mediated induction of DNA damage; (ii) reduced thermotolerance and (iii) prolonged and enhanced the effects of HT on DSB repair. Our preliminary results thus establish HSP90 inhibition as a straightforward and efficient approach to improve HT treatment efficacy with no or limited systemic toxicity. Aims. We are currently investigating the effects of HSP90 inhibition on the efficacy of anticancer treatments involving HT in animal models of cancer, in vivo. The long-term goal of our study is boosting the effectiveness of HT treatments in the clinic. Relevance. We are confident that positive results of our current in vivo studies will find their way into clinical practice. Together with clinicians of AMC and EMC, we are already considering various groups of patients that would most benefit from our improved treatments. Since ganetespib has a favorable safety profile and is already used clinically, we are convinced that the first trials could be initiated in the near future. van Montfort T, Thomas AA, Krawczyk PM, Berkhout B, Sanders RW, Paxton WA. Reactivation of Neutralized HIV-1 by Dendritic Cells Is Dependent on the Epitope Bound by the Antibody. J Immunol. 2015 Oct 15;195(8):3759-68. dx.doi.org/10.4049/jimmunol.1402344. Epub 2015 Sep 9. https://www.ncbi.nlm.nih.gov/pubmed/26355155. Recently, we published a meta-analysis of the kinetics with which proteins involved in repair of DNA double-strand breaks accumulate at DNA lesions. The online interface for exploring the accumulation kinetics can be found here. For openly-accessible full version of the article click here.